I would just like to inform you how wonderful books are, and how great it is to get them. Okay, now that I’ve done that, I can tell you about my adventures today. I went to the library with two friends, and instead of going into the library area (read: books to borrow for three weeks and bring back) we saw the used books section which was $5 per bag. Each bag was a shopping bag. This resulted in us spending about two hours looking through the books. Final result: four bags of books, two of us having one bag each, and another friend having 2. My books consisted of some typography books (Letraset! Font reference guides!) as you can see at the top of the following picture. There’s also Dirk Gently, because I haven’t read it yet, Will Grayson, Will Grayson (this was signed, I’m so sad for the person that gave away a signed copy! 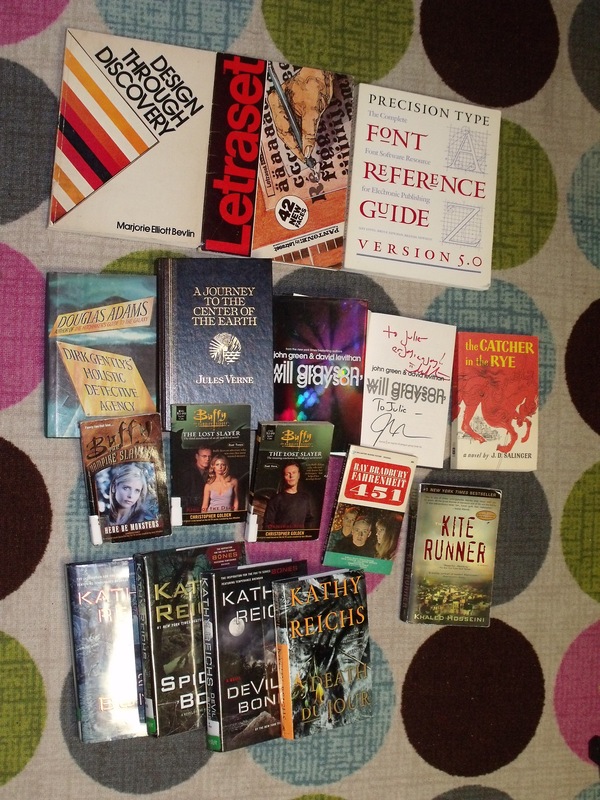 ), a few Buffy books, and four books that inspired the show Bones (I’ll probably read them eventually). There are a few others you can see, I just don’t feel like listing everything. I also found 3 books that will be gifts, and they’re not pictured here, as well as a hardcover version of Eragon to match my set. There’s also a Sorcerer’s Stone audiobook on cassette, as my car luckily only has a cassette player. 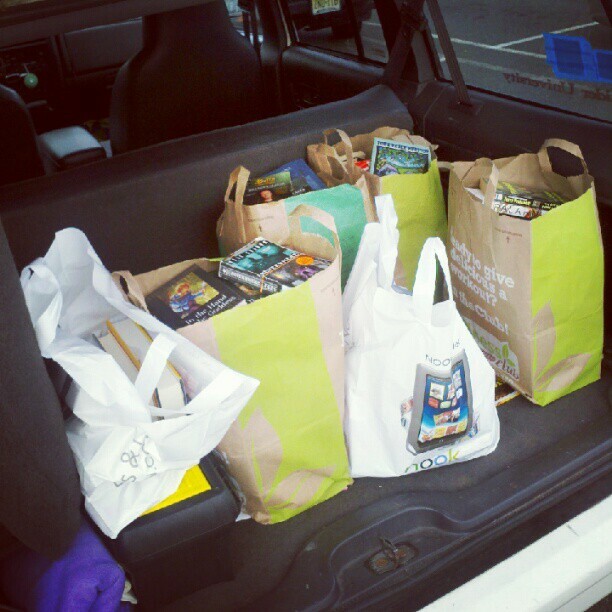 So between all four of us, the car looked like this: Okay, as you can see, two bags here are not paper bags from the library. That’s because we also went to Barnes and Noble. Of course, J.K. Rowling’s new book, The Casual Vacancy, was just released, and I did a bad job of resisting the urge to buy it. 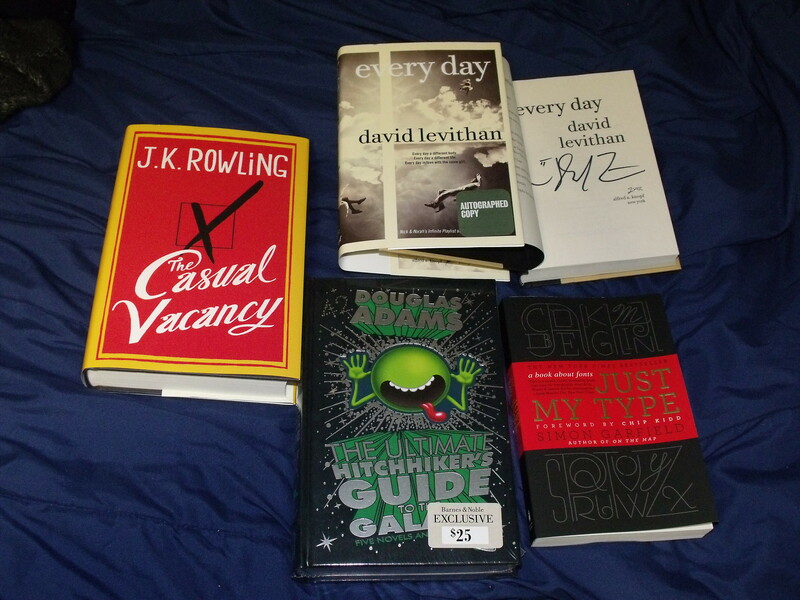 I also bought David Levithan’s Every Day, because I keep hearing raving reviews (and it also just happened to be signed! ), Just My Type, because I’m halfway through and I would like to own it, and The Ultimate Hitchhiker’s Guide to the Galaxy, because I’ve wanted the Barnes and Noble version for a long time as I only have the set in a big softcover book. I think therefore, today was a successful day.